whites. A fresh egg white mixture will need to be whisked up for making the second batch. To make the coulis, purée the raspberries with the sugar and lemon juice in a food processor. Push it through a sieve to remove the raspberry pips. Add more sugar to taste. Brush the insides of 4 ramekins with the melted butter and coat with sugar, shaking out any excess. Place 1 tablespoon jam in each then chill in the fridge. Mix the cream, flour and cornflour to a smooth paste.Warm the milk over a medium heat, until just boiling, then gradually stir into the paste. Whisk until smooth then pour the mixture back into the saucepan and place over a gentle heat. Continue beating vigorously until thickened. Place the egg yolks in a separate small bowl and add the caster sugar. Mix to a thick paste, then add to the saucepan and mix well until smooth. Return to the hob to thicken, whisking until it begins to bubble – be careful not to scramble the eggs. When the mixture looks like custard, remove from the heat and put aside to cool completely. (At this point you can chill the mixture in the fridge for up to 2 days and finish the soufflés just before serving.) Preheat the oven to 180°C/gas 4. Put the egg whites into a large bowl and beat with an electric mixer until soft peaks form. Add 1 large spoonful of the egg whites and 6 tablespoons raspberry coulis to the cooled mixture, then beat well. Carefully fold in the remaining egg whites. Fill the ramekins to the brim and level off with a spatula. Place them on a baking sheet in the middle of the oven for about 14 minutes until risen and turning golden. 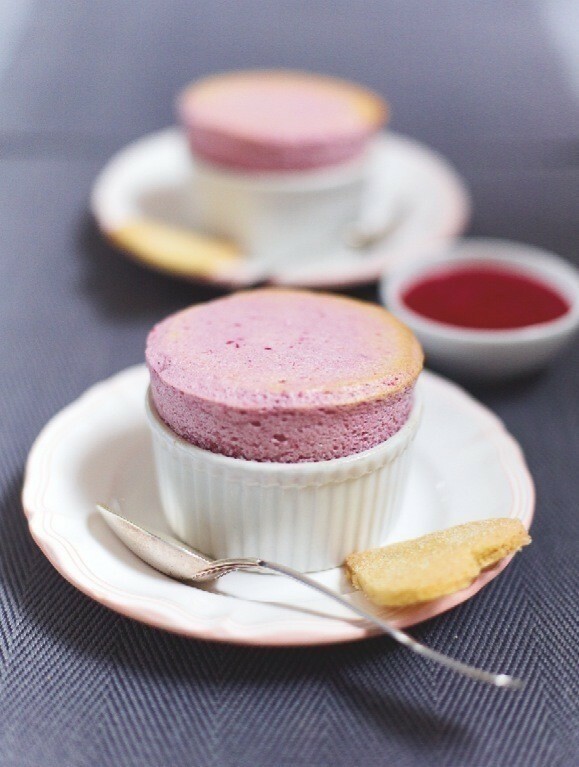 Serve immediately, with the raspberry coulis and shortbread heart biscuits. A half bottle of Sauternes to share. By plain flour, would that be All Purpose Flour?